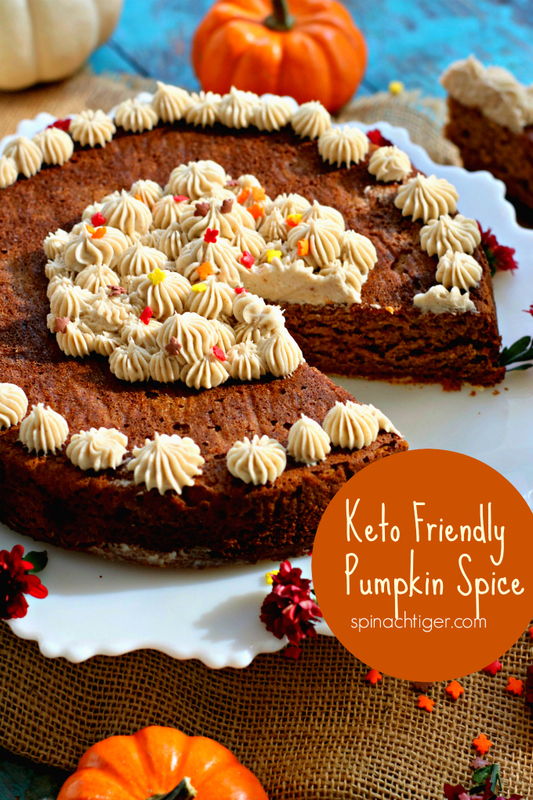 Grain Free Pumpkin Spice Cake, Keto Friendly, Outrageously Good. 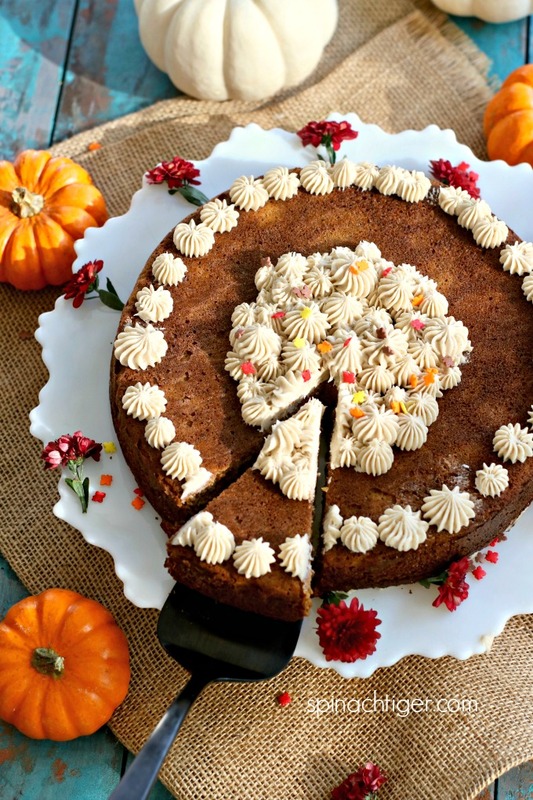 This grain free pumpkin spice cake just might be my favorite Autumn dessert, although these maple cheesecake bars are a close second. 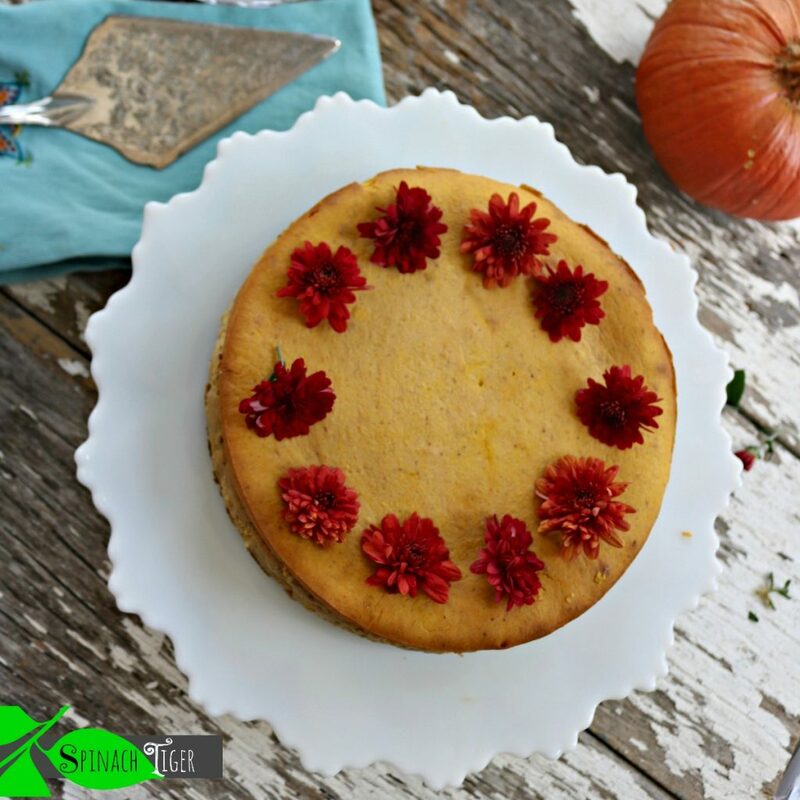 After many tries figuring out to make a great cake with almond flour, this orange cake that went through six trials helped me determine a good “basic” almond flour recipe that can enjoy several variations. 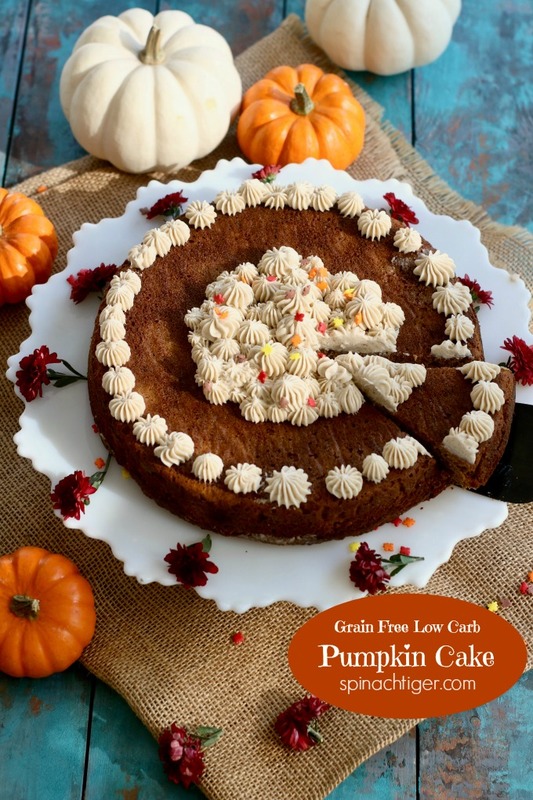 Grain Free Pumpkin Spice Cake is kind of a cross between a pumpkin cake and pumpkin bread. I make it as a one layer snacking cake, but you easily double the recipe and make a layer cake, with the frosting recipe below. It has the heft and flavor pumpkin bread but also has the texture of a good Autumn Holiday cake. My basic recipe includes 280 grams of blanched almond flour, five eggs, one teaspoon baking powder, one half cup of oil or butter (or a combo) and one cup of something. In this I used half oil, half butter. Amazon Affiliate links will earn a small commission, not affecting pricing. In this case the something is pumpkin. You can use regular sugar. I made this sugar free and I used Swerve as my sweetener. If you’re new here, Swerve is the sweetener I now use in my desserts. It’s a powdered erythritol that has no carbs and does not spike blood sugar. They now make a brown sugar and I used some of that in this cake. You can use regular sugar in this recipe should you want to. It will measure one to one. The Nutrition Count: 5 Carbs, 2 Fiber, 2 Net Carbs. This recipe contains Amazon Affiliate links which earn a small commission not affecting price. Prepare 9 inch cake pan with baking spray and or parchment paper. Beat eggs with Granulated Swerve for three minutes with mixer. 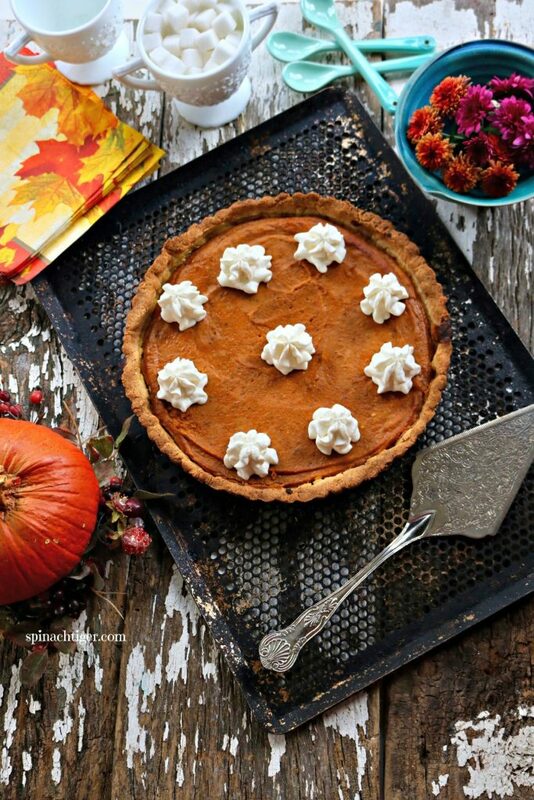 Mix pumpkin puree with pumpkin spice, Swerve brown sugar. Add oil to pumpkin puree. Add pumpkin mixture to eggs. Slowly add in almond flour mixture. Prepare pan with parchment paper and baking spray. Bake at 350 for 35-40 minutes. Cover with foil at around 30 minutes. Make sure cream cheese is completely at room temperature. You might even want to microwave for a 10 to 20 seconds. Add softened butter and incorporate well. 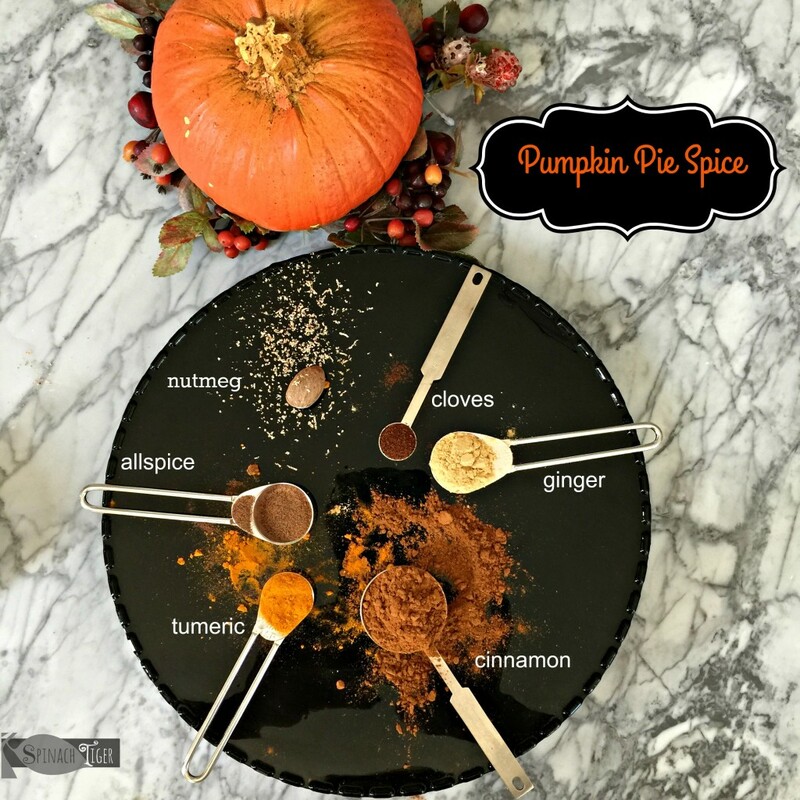 Add in 1 to 3 teaspoons pumpkin pie spice (depends on your own taste). The flavors will not take hold completely until refrigerated a few hours. Frost cake by spreading frosting over cake or decorating as seen in picture. I prefer this cake refrigerated. It will keep up to a week. It will also freeze. If you use sugar instead of swerve, the measurement is one to one.